This article is about the immediate family of Donald Trump. For the history of the extended Trump family as a whole, see Trump family. 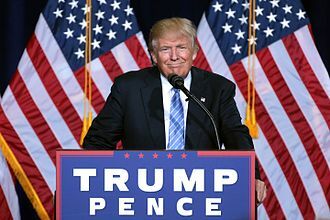 The family of Donald Trump, the 45th president of the United States, is a prominent American family active in real estate, entertainment, business, and politics. Trump's immediate family circle is the First Family of the United States. They are part of the broader Trump family originating from Germany. Donald Trump's mother, Mary Anne MacLeod, came from the Hebridean island of Lewis, off the west coast of Scotland. Trump has five children (between three wives) and nine grandchildren. Ivana Marie Trump (née Zelníčková), the first wife of Donald Trump, was born on February 20, 1949 in Zlín, Czechoslovakia (now the Czech Republic). She is a former fashion model and a businesswoman. They were married from 1977 until 1992. Ivana Trump took a major role in The Trump Organization. She became the Vice President of Interior Design for the company, leading the signature design of Trump Tower. Afterwards, her then-husband appointed her to head up the Trump Castle Hotel and Casino as president. She became a naturalized U.S. citizen in 1988. Marla Ann Maples, the second wife of Donald Trump, was born on October 27, 1963 in Dalton, Georgia, making her Donald Trump's only wife who was an American citizen at the time of their marriage. She is an actress and television personality. They were married from 1993 to 1999. Melania Trump (née Knavs), the third wife of Donald Trump, was born on April 26, 1970, in Novo Mesto, Yugoslavia (present-day Slovenia). She has had a lengthy modeling career and is the second foreign-born First Lady of the United States. They were married in 2005. Donald Jr., Ivanka, and Eric are Trump's three eldest children, from his first marriage with Ivana Trump. Prior to the election, each of the siblings held the title of Executive Vice President at The Trump Organization. During the campaign, they served as surrogates for their father on national news programs. Following Trump's election victory, all three were named to the presidential transition team. Following the inauguration, Donald Jr. and Eric took charge of the family's real estate empire. Ivanka moved to Washington, D.C. with her husband Jared Kushner, who was appointed to a senior White House advisory position. Tiffany Ariana Trump (born October 13, 1993) is Donald Trump's only child with Marla Maples. In 2016, she participated little in her father's campaign because she was attending the University of Pennsylvania, her father's alma mater. Shortly after graduating in sociology and urban studies, she made a speech for her father at the Republican National Convention at age 22. Not to be confused with Baron Trump novels. 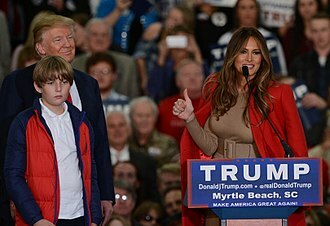 Barron William Trump (born March 20, 2006) is Donald Trump's youngest child and his only child with Melania Trump. He is of German and Scottish descent on his father's side and Slovenian descent on his mother's side. In May 2006, Barron Trump received the Christian sacrament of baptism at The Episcopal Church of Bethesda-by-the-Sea in Palm Beach, Florida. 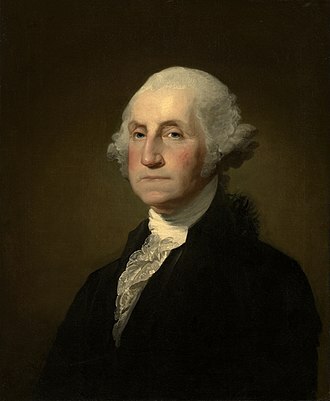 He attended the Columbia Grammar & Preparatory School in Manhattan. Barron is fluent in English and Slovene. During his early childhood, Barron made several television appearances, including on The Apprentice and a May 16, 2006 episode of The Oprah Winfrey Show at only 2 months old. Barron did not immediately move into the White House when his father became president, but remained at Trump Tower with his mother until the end of the 2016–2017 school year. Melania and Barron moved to the White House on June 11, 2017, and he now attends St. Andrew's Episcopal School in Potomac, Maryland. Donald Trump has nine grandchildren. 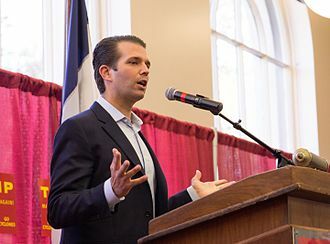 Donald Trump Jr. and his former wife Vanessa have five children: daughters Kai Madison (born May 12, 2007) and Chloe Sophia (born June 16, 2014), and sons Donald John III (born February 18, 2009), Tristan Milos (born October 2, 2011), and Spencer Frederick (born October 21, 2012). Ivanka Trump and her husband Jared Kushner have three children: daughter Arabella Rose Kushner (born July 17, 2011), and sons Joseph Frederick Kushner (born October 14, 2013) and Theodore James Kushner (born March 27, 2016). On September 12, 2017, Eric Trump and his wife Lara announced the birth of their son Eric "Luke" Trump, who is their first child and Donald Trump's ninth grandchild. Donald Trump's paternal ancestry is traceable to Bobenheim am Berg, a village in the Palatinate, Germany, in the 18th century. Johann Trump, born in Bobenheim in 1789, moved to the nearby village of Kallstadt where his grandson, Friedrich Trump, the grandfather of Donald Trump, was born in 1869. This German heritage was long concealed by Donald Trump's father, Fred Trump, who had grown up in a mainly German-speaking environment until he was 10 years old; after World War II and until the 1980s, he told people he was of Swedish ancestry. Donald Trump repeated this version in The Art of the Deal (1987) but later said he is "proud" of his German heritage, and served as grand marshal of the 1999 German-American Steuben Parade in New York City. Donald Trump's father, Fred Trump (1905–1999), born in New York, was one of the biggest real estate developers in New York City. Using his inheritance, Fred Trump and his mother Elizabeth founded Elizabeth Trump & Son. Donald Trump later renamed it The Trump Organization and served as its chairman and president until assuming the office of U.S. President. Born as Mary Anne MacLeod (1912–2000) in Tong, a small village near Stornoway, in the Western Isles of Scotland, she was the daughter of fisherman Malcolm MacLeod and Mary MacLeod (née Smith). At age 17, she immigrated to the United States and started working as a maid in New York. Mary and Donald Trump's father Fred Trump met in New York and married in 1936, settling together in Queens. Mary became a U.S. citizen in 1942. Donald Trump has said that he "feels Scottish". In 1885, Donald Trump's grandfather, Friedrich Trump, emigrated from Kallstadt, Palatinate (then part of the Kingdom of Bavaria), to the United States at age 16. 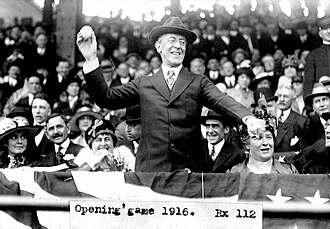 He anglicized his name to Frederick in 1892 when he became a U.S. citizen. During the Klondike Gold Rush, he amassed a fortune by opening a restaurant and hotel in Bennett and later Whitehorse, serving gold seekers on their way to the region; one biographer wrote that the business included a brothel, a portrayal Donald Trump has said was "totally false". After his death, his fortune was passed on to his wife and son. Frederick Trump was a second cousin of Henry J. Heinz, founder of H. J. Heinz Company, whose father also came from Kallstadt. Donald Trump's grandmother, Elizabeth Christ Trump, née Christ, was born in 1880 and died on June 6, 1966. Born Elisabeth Christ, she married Frederick Trump in 1902 and moved to the United States with him. Like her husband, she was a native of Kallstadt, born as the daughter of Philipp and Marie Christ. Philipp Christ was descended from Johannes Christ (1626–1688/9) of Flörsheim, Hesse. Elizabeth Christ Trump was a descendant of organ builder Johann Michael Hartung (1708–1763) through her paternal grandmother Sabina Christ. Donald Trump's paternal uncle John George Trump (1907–1985) was an electrical engineer, inventor and physicist who developed rotational radiation therapy, and, together with Robert J. Van de Graaff, one of the first million-volt X-ray generators. He was a recipient of Ronald Reagan's National Medal of Science and a member of the National Academy of Engineering. Maryanne Barry (born 1937) is Donald Trump's eldest sister. She was a senior judge of the United States Court of Appeals for the Third Circuit. Fred Trump Jr. (1938–1981) was Donald Trump's older brother. While attending Lehigh University, he joined a Jewish fraternity, Sigma Alpha Mu, even though he was not Jewish. After he graduated, he was unable to work with his father in his family business, so he flew planes for Trans World Airlines. 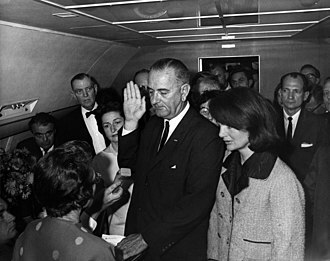 In 1962, he was married to Linda Clapp and had two children, Fred and Mary, before their divorce. In 1981, he died as a result of his ongoing alcoholism. His death caused Donald Trump to avoid alcohol and cigarettes. Elizabeth Trump Grau (born 1942) is an older sister of Donald Trump. In 1989, she married film producer James Grau. She worked as an executive for Chase Manhattan Bank, before retiring to Florida. Robert Trump (born 1948) is Donald Trump's younger brother. He is a retired business executive and real estate developer who managed the Trump Organization's real estate holdings outside Manhattan. He was married to Blaine Trump until their divorce in 2007. He serves on the board of directors for ZeniMax Media. The German Trump family as such does not have a coat of arms, but Donald Trump has used a number of logos in the style of coats of arms for his businesses. According to German heraldic tradition, anyone can freely assume a coat of arms if they so desire. The coat of arms granted to Davies in 1939 bears the motto "Integritas". After purchasing the estate of Mar-a-Lago in 1985, Donald Trump adopted the coat of arms of Joseph E. Davies, the third husband of Marjorie Merriweather Post, the socialite who built the resort. The coat of arms had been granted to Davies, a former US ambassador of Welsh origins, by British heraldic authorities in 1939. Since there is no official regulation on arms in the United States, The Trump Organization took Davies's coat of arms and uses it at Donald Trump's golf courses and estates across the country. It has also been properly registered with the US patent and trademark office. The coat of arms granted to "The Trump International Golf Club Scotland Ltd" in 2011 bears the battle cry: "Nunquam Concedere". Party per chevron: Azure two Mullets Argent; Vert a double headed Eagle displayed of the second, beaked, taloned and langued Gules, holding in its talons two Globes of the second; overall three chevronels Or. A demi Lion rampant Gules, armed and langued Azure, holding in the paws a Pennon Or flowing to the sinister. "Numquam concedere" (Latin for "Never Give Up"). Sarah Malone, executive vice-president of "The Trump International Golf Links, Scotland", said that "the coat of arms brings together visual elements that signify different aspects of the Trump family heritage [...], the Lion Rampant [in the crest] makes reference to Scotland and the stars to America. Three chevronels are used to denote the sky, sand dunes and sea—the essential components of the site, and the double-[headed] Eagle represents the dual nature and nationality of Trump's heritage (Scottish and German). The Eagle clutches golf balls making reference to the great name of golf, and the motto Numquam Concedere is Latin for Never Give Up—Trump's philosophy". From 2014, Trump used the same logo for "The Trump International Golf Links, Ireland", the golf resort built from his acquisition of Doonbeg Golf Club. ^ "Scottish Roots - Donald Trump". Scottish Roots. Retrieved January 29, 2018. ^ "Ivana Trump becomes U.S. citizen". Associated Press. May 27, 1988. Retrieved August 21, 2015. ^ "The Model American". The New Yorker. May 9, 2016. Retrieved November 10, 2016. ^ "Donald Trump's kids might have saved the convention". CNN. July 22, 2016. Retrieved November 12, 2016. ^ Effron, Lauren; Santucci, John (January 19, 2017). "How Trump's Eldest Children Have Been Handling the White House Transition". ABC News. Retrieved January 20, 2017. 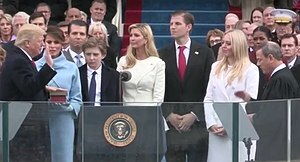 ^ "US election: Trump children – who is the new first family?". BBC News. November 9, 2016. Retrieved November 10, 2016. ^ "Who Is Donald's Lesser-Known Daughter, Tiffany Trump?". Vogue. July 20, 2016. Retrieved November 10, 2016. ^ Alison Fox (November 21, 2016). "Get to know Barron Trump, the president-elect's 5th child". am New York. Retrieved December 15, 2016. ^ Bailey, Sarah Pulliam (May 25, 2017). "Melania Trump is Catholic, she confirms after Vatican visit". The Washington Post. Retrieved May 26, 2017. He and the first lady were married in 2005 in an Episcopal church in Palm Beach, Fla., where their son Barron Trump was later baptized. ^ Murphy, Stephanie (May 9, 2017). "Melania Trump Mother's Day interview: 'It's unconditional love'". Palm Beach Daily News. Retrieved May 26, 2017. Donald and Melania Trump leave The Episcopal Church of Bethesda-by-the-Sea after the baptism of 8-month-old Barron William Trump on Dec. 8, 2006. ^ Dziemianowicz, Joe; Pesce, Nicole (November 10, 2016). "Meet future First Kid, Barron 'little Donald' Trump". New York Daily News. Retrieved November 11, 2016. ^ "The TV Debut of Barron Trump". The Oprah Winfrey Show. OWN. Retrieved February 24, 2018. ^ Haberman, Maggie (November 20, 2016). "Melania and Barron Trump Won't Immediately Move to White House". The New York Times. Retrieved November 21, 2016. ^ Bailey, Sarah Pulliam (May 25, 2017). "Melania Trump is Catholic, she confirms after Vatican visit". The Washington Post. Retrieved May 26, 2017. Melania and Barron Trump have been living in Manhattan while he finishes his school year on the Upper West Side. After they move to the White House this summer, he will attend St. Andrew’s Episcopal, a prep school in Potomac, Md., where just 16 percent of its students are Episcopalian. ^ "Transcript: George Stephanopoulos Interviews Donald and Melania Trump". ABC News. October 27, 2016. Retrieved November 11, 2016. ^ Lopez, Marina (July 17, 2016). "What Does Barron Trump Think of His Dad Running for President? He Hasn't Given Interviews". Romper. Retrieved November 11, 2016. ^ "Barron Trump arrives to father Donald's Inauguration Day". Daily Mail. Associated Newspapers. January 20, 2017. Retrieved January 20, 2017. ^ Goff, Steven (April 18, 2017). "Barron Trump likes soccer. And Arsenal. And D.C. United?". The Washington Post. Retrieved September 22, 2017. ^ Kennedy, Paul (September 22, 2017). "Barron Trump plays for D.C. United in Development Academy". Soccer America. Retrieved September 22, 2017. ^ Dagostino, Mark (May 13, 2007). "It's a Girl for Donald Trump Jr. and Wife Vanessa". People. Retrieved July 14, 2008. ^ Michaud, Sarah (June 18, 2014). "Donald and Vanessa Trump Welcome Daughter Chloe Sophia". People. Retrieved September 28, 2014. ^ Dagostino, Mark (February 18, 2009). 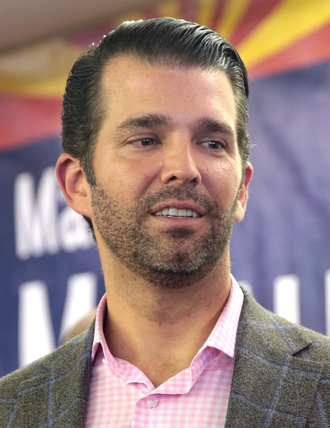 "Donald Trump Jr. 'Extremely Excited' About New Baby". People. Retrieved May 5, 2012. ^ Ravitz, Justin (October 3, 2011). "Update: Vanessa, Donald Trump Jr. Welcome Baby Boy Tristan Milos". US Weekly. Retrieved October 5, 2011. ^ Michaud, Sarah (October 3, 2011). "Donald Trump, Jr. Welcomes Son Tristan Milos". People. Retrieved October 5, 2011. ^ "Donald Trump Jr welcomes a fourth child with wife Vanessa". Daily Mail. October 21, 2012. Retrieved October 22, 2012. ^ "Ivanka Trump and Jared Kushner welcome baby girl". Herald Sun. July 17, 2011. Retrieved July 17, 2011. ^ "Ivanka Trump tweets birth announcement of 1st child, a daughter born in NYC". The Washington Post. July 17, 2011. Archived from the original on March 10, 2016. Retrieved July 17, 2011. ^ Ivanka Trump [@IvankaTrump] (April 11, 2013). "Jared and I are excited that Arabella will become a big sister this fall. Thanks for all your good wishes! xo Ivanka" (Tweet). Retrieved May 21, 2013 – via Twitter. ^ "Ivanka Trump Gives Birth to Theodore James Kushner". NBC News. March 28, 2016. Retrieved March 6, 2016. ^ "Eric Trump, Lara welcome first son". Fox News. September 12, 2017. Retrieved October 3, 2018. 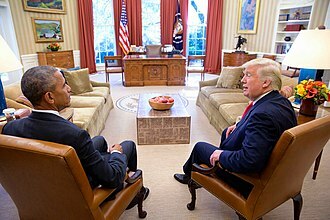 ^ Verein für Computergenealogie: Vorfahren von Friederich "Fritz" Trump Archived August 3, 2017, at the Wayback Machine. ^ Other spelling variants found in Kallstadt include Drumb, Tromb, Tromp, Trum, Trumpff, Dromb. Kate Connolly, Kallstadt, Germany: on the trail of 'the Donald' in the Trump ancestral home, The Guardian, January 29, 2016. (Blair 2001:26) cites Hanns Drumpf, recorded in 1608. ^ Blair, The Trumps, p.115. ^ Rozhon, Tracie (June 26, 1999). "Fred C. Trump, Postwar Master Builder of Housing for Middle Class, Dies at 93". New York Times. Retrieved March 17, 2017. ^ a b Carrell, Severin (June 9, 2008). "'I feel Scottish,' says Donald Trump on flying visit to mother's cottage". The Guardian. Retrieved July 24, 2016. ^ a b Frates, Chris (August 24, 2015). "Donald Trump's immigrant wives". CNN. Retrieved September 3, 2015. ^ a b Blair, Gwenda (August 24, 2015). "The Man Who Made Trump Who He Is". Politico. Retrieved July 24, 2016. ^ "Mary MacLeod Trump Philanthropist, 88". The New York Times (Obituary). August 9, 2000. Retrieved May 12, 2016. ^ "Trump Organization Next Generation: Donald Jr Ivanka Eric Trump Hotel Collection Real Estate Casinos Golf Clubs Restaurants Merchandise Corporation Company Publications". Retrieved May 14, 2016. ^ a b c Pilon, Mary (June 24, 2016). "Donald Trump's Immigrant Mother". The New Yorker. ^ McGrane, Sally (April 29, 2016). "The Ancestral German Home of the Trumps". The New Yorker. ^ Pearson, Natalie Obiko (October 26, 2016). "Trump's Family Fortune Originated in a Canadian Gold-Rush Brothel". Bloomberg. Retrieved January 12, 2018. ^ "GEDBAS: Vorfahren von Frederick Christ TRUMP". Archived from the original on November 4, 2016. Retrieved November 10, 2016. ^ Goldmacher, Shane (January 25, 2017). "Trump's sister weighs in on Supreme Court pick". Politico. Retrieved August 16, 2017. ^ Gerber, Drew (August 3, 2016). "That Time Trump's Older Brother Fred Pretended To Be Jewish — To Join a Jewish Frat". The Forward. Retrieved June 10, 2017. ^ a b c Horowitz, Jason (January 2, 2016). "For Donald Trump, Lessons From a Brother's Suffering". The New York Times. Retrieved June 10, 2017. ^ Cheever, Susan (January 9, 2016). "In Opinion: What Donald Trump learned from his alcoholic brother Fred". Newsweek. Retrieved June 10, 2017. ^ McBride, Jessica (July 22, 2016). "Fred 'Freddy' Trump, Jr. : 5 Fast Facts You Need to Know". Heavy.com. Retrieved June 10, 2017. ^ a b Lavender, Paige (May 14, 2017). "Donald Trump Opens Up About His Late Brother Fred". Huffington Post. Retrieved June 10, 2017. ^ "Meet the Trumps: The family tree of Donald Trump". MSN News. May 8, 2018. Retrieved May 28, 2018. ^ "Elizabeth Trump weds James Grau". New York Times. March 27, 1989. Retrieved May 28, 2018. ^ Gavin, Michael (June 23, 2017). "Trump sister sells oceanfront Westhampton Beach home for $3.8M". Newsday. Retrieved May 28, 2018. ^ Wead, Doug (2017). Game of Thorns: The Inside Story of Hillary Clinton's Failed Campaign and Donald Trump's Winning Strategy. Center Street. ^ Chabba, Seerat (November 15, 2016). "Who Are Donald Trump's Siblings?". International Business Times. Yahoo News. Retrieved March 23, 2016. ^ Blair, Gwenda (2015). The Trumps: Three Generations of Builders and a Presidential Candidate. Simon & Schuster. p. 454. ISBN 1501139363. ^ Horowitz, Jason (January 2, 2016). "For Donald Trump, Lessons From a Brother's Suffering". New York Times. Retrieved February 11, 2017. ^ "The Winning Ways of Blaine Trump". New York Times. October 28, 1987. Retrieved February 11, 2017. ^ Rosenblum, Emma (December 8, 2007). "Divorce, Park Avenue Style". New York Magazine. Retrieved February 11, 2017. ^ Hakim, Danny (May 28, 2017). "The Coat of Arms Said 'Integrity.' Now It Says 'Trump.'". The New York Times. Retrieved February 14, 2018. ^ "Trademark of Trump crest". Justia trademarks. Retrieved February 15, 2018. ^ a b Guest (January 17, 2012). "Donald Trump awarded Scottish coat of arms after four year battle". Deadline. Retrieved February 14, 2018. ^ Court of the Lord Lyon, @LyonCourt (November 14, 2016). "Trump International Golf Club Scotland Ltd was granted arms in 2011, replacing an assumed design they had previously used". Twitter. Retrieved February 14, 2018. ^ Court of the Lord Lyon, @LyonCourt (January 21, 2017). "We granted these arms to Trump International Golf Course Scotland Ltd in 2012. Here is the colour version: ..." Twitter. Retrieved February 15, 2017. ^ "Trump confirms Doonbeg buy – rebranded "Trump International Golf Links, Ireland"". irishgolfdesk.com. Retrieved November 19, 2016. ^ "About the Course – Trump International Golf Club 2016 – Doonbeg". trumpgolfireland.com. Retrieved November 19, 2016. John Glover Roberts Jr. is the 17th and current Chief Justice of the United States. He took his seat on September 29,2005, having been nominated by President George W. Bush after the death of Chief Justice William Rehnquist and he has been described as having a conservative judicial philosophy in his jurisprudence. Roberts grew up in northwest Indiana and was educated in a private school and he attended Harvard College and Harvard Law School, where he was a managing editor of the Harvard Law Review. During this time, he argued 39 cases before the Supreme Court, notably, he represented 19 states in United States v. Microsoft. In 2003, Roberts was appointed as a judge of the D. C. Circuit by President George W. Bush, during his two-year tenure on the D. C. Circuit, Roberts authored 49 opinions, eliciting two dissents from other judges, and authoring three dissents of his own, in 2005, Roberts was nominated to be an Associate Justice of the Supreme Court, initially to succeed retiring Justice Sandra Day OConnor. When Chief Justice Rehnquist died before Robertss confirmation hearings began, Bush instead nominated Roberts to fill the Chief Justice position, Roberts has authored the majority opinion in many landmark cases, including Parents Involved in Community Schools v. Seattle School District No. 1, Shelby County v. Holder, and National Federation of Independent Business v. Sebelius, John Glover Roberts was born in Buffalo, New York, the son of Rosemary and John Glover Jack Roberts Sr. His father was a plant manager with Bethlehem Steel and he has Irish and Czech ancestry. When Roberts was in grade, his family moved to Long Beach. He grew up with three sisters, Kathy and Barbara, Roberts attended Notre Dame Elementary School, a Roman Catholic grade school in Long Beach. In 1973, he graduated from La Lumiere School, a Roman Catholic boarding school in La Porte, Indiana and he studied five years of Latin, some French, and was known generally for his devotion to his studies. He was captain of the team, and was a regional champion in wrestling. Ivana Marie Trump is a Czech-American businesswoman, author and former fashion model. She was the first wife of U. S. President Donald Trump from 1977 until 1992, Ivana Zelníčková was born in the Moravian town of Zlín, the daughter of Miloš Zelníček, who was Czech, and Marie Francová. From a very young age, her father nurtured and encouraged her skiing talent, in the early 1970s, she attended Charles University in Prague. It is sometimes said that Zelníčková was selected as an alternate on the Czechoslovak ski team during the 1972 Winter Olympics, her specialties being the downhill and slalom. However, in 1989, Petr Pomezný, Secretary General of the Czechoslovak Olympic Committee, Who is this Ivana woman and we have searched so many times and have consulted many, many people, and there is no such girl in our records. In 1971, Zelníčková married real estate agent Alfred Winklmayr and she left Czechoslovakia for Canada to be with a childhood friend, George Syrovatka, who owned a ski boutique there. For the following two years, she lived in Montreal, improved her English by taking courses at McGill University. 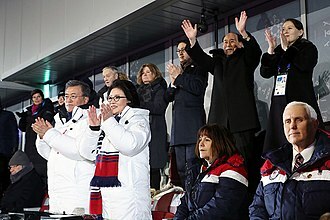 Zelníčková left Syrovatka and moved to New York to promote the Montreal Olympics, in New York, Zelníčková met Donald Trump, son of real estate developer Fred Trump. On April 7,1977, they married in a lavish wedding and Ivana Trump became leading figures in New York society during the 1980s. They had three children, Donald John Jr. Ivanka Marie, and Eric Fredrick, Donald Jr. Ivana has eight grandchildren. Ivana took a role in The Trump Organization. She became the Vice President of Interior Design for the company, her then-husband appointed her to head up the Trump Castle Hotel and Casino as president. She became a naturalized U. S. citizen in 1988, in the late 1980s, she left Atlantic City to devote more time to her family. Her husband asked her to oversee the restoration of the landmark Plaza Hotel and she was named Hotelier of the Year in 1990. Toward the end of year, rumors began to circulate that Donald Trump was having an affair with a former beauty queen from Georgia. Henry J. Heinz, the founder of the Heinz company, was the grandson of Charlotte Louisa Trump. 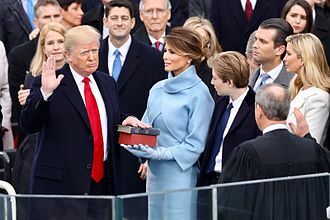 Donald Trump takes the oath of office as the President of the United States. Rick Gates was Deputy Chairman and did much of the actual work. Then-President-elect Trump and his wife, Melania, arriving at Joint Base Andrews in Washington, D.C. for the inauguration. John Roberts appears in the background, as President Bush announces his nomination of Roberts for the position of Chief Justice. Roberts is sworn in as Chief Justice by Justice John Paul Stevens in the East Room of the White House, September 29, 2005. Barack Obama being administered the oath of office by Roberts a second time on January 21, 2009. Dilma Rousseff takes the oath of office of the President of Brazil. Li Keqiang publicly swore an oath to the Constitution upon formally taking office after he was appointed as the Premier in the 1st Session of the 13th National People's Congress. Hassan Rouhani takes the oath of office as the President of Iran. Several thousands of people, many of them dressed in purple formed a human chain on the sidewalk across the Golden Gate Bridge to peacefully oppose the inauguration of Donald Trump. 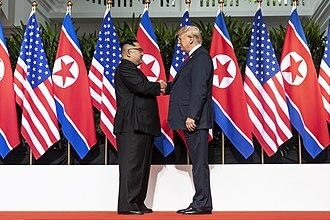 Limo smashed in Washington, D.C.
President Donald Trump and Chairman Kim Jong-un shaking hands at the first night of the summit held at the Metropole Hotel in Hanoi, Vietnam, on February 27–28, 2019. 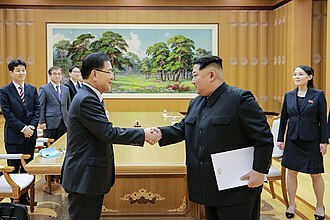 This was the second meeting between the leaders of the DPRK and the United States, following the first meeting in June 2018 in Singapore. 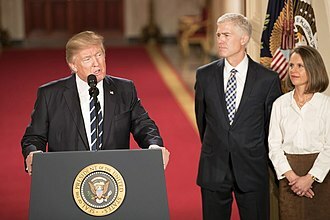 Judge Neil Gorsuch, his wife Louise, and Donald Trump during the announcement in the East Room of the White House. Following Kavanaugh's confirmation, several protests were held around the United States by women's rights activists. 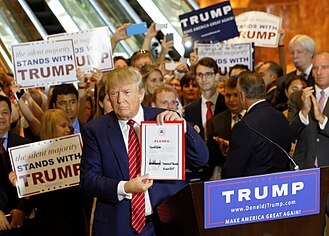 Trump signs the Republican loyalty pledge: had Trump not become the Republican Party nominee for the 2016 general election, he pledged to support whomever the nominee may have been, and to not run as a third-party candidate. 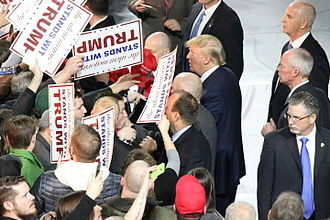 Trump and supporters at a rally in Muscatine, Iowa, January 2016. Multiple supporters hold up signs stating "The silent majority stands with Trump." Trump speaking at a rally in Phoenix, Arizona, August 2016. U.S. Senator Mark Warner, the Vice Chair of the Senate Intelligence Committee, called Huawei a threat to U.S. national security. 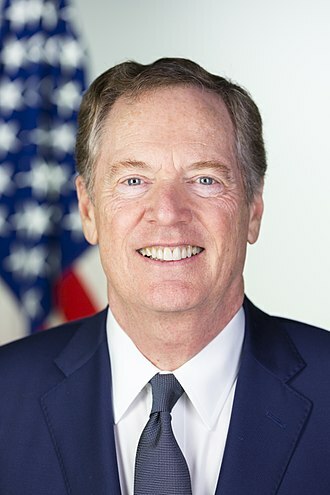 President Trump appointed Trade Representative Robert Lighthizer as lead negotiator to oversee the 90-day negotiation. Israel occupied East Jerusalem during the Six-Day War in 1967 and formally annexed it in 1980 (see Jerusalem Law). 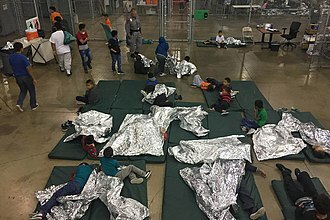 A flyer circulated by the Department of Homeland Security in 2018 offering assistance to parents separated from their children while in custody. Chart showing agency appointment group leads of the Trump transition. Former Ohio Secretary of State Ken Blackwell led appointment selections for positions involving domestic issues. Retired Gen. Keith Kellogg led the defense "agency action" unit of the transition. King Salman and President Trump take part in the traditional ardah dance at the Murabba Palace. 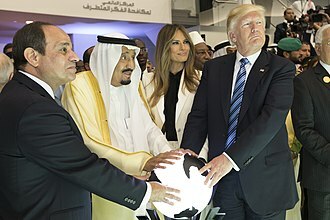 The Iranian government would go on employ this as symbolic of US complicity for the Saudi-led group's actions in the Qatari crisis. Acosta being sworn in as the Secretary of Labor by Vice President Mike Pence, on April 28, 2017. 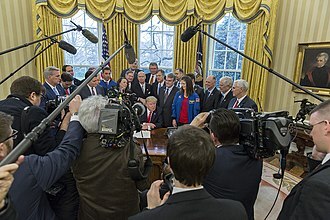 Trump announces United States withdrawal from the JCPOA on May 8, 2018.